Webster’s Dictionary defines happiness as a state of well-being and contentment. Most people feel happy when their needs in life are being met. Being happy is a goal that most people have in life but is something that many have a hard time figuring out. Happiness is something that takes work. You can’t just say that you have achieved a state of happiness and then sit back and relax and expect it to stay. As a counselor and therapist I have worked with many clients who want to reach that state of contentment and eliminate stress, anxiety, and frustration from their lives. Have you ever wondered what it takes to be a happy person? What are the traits that happy people have? 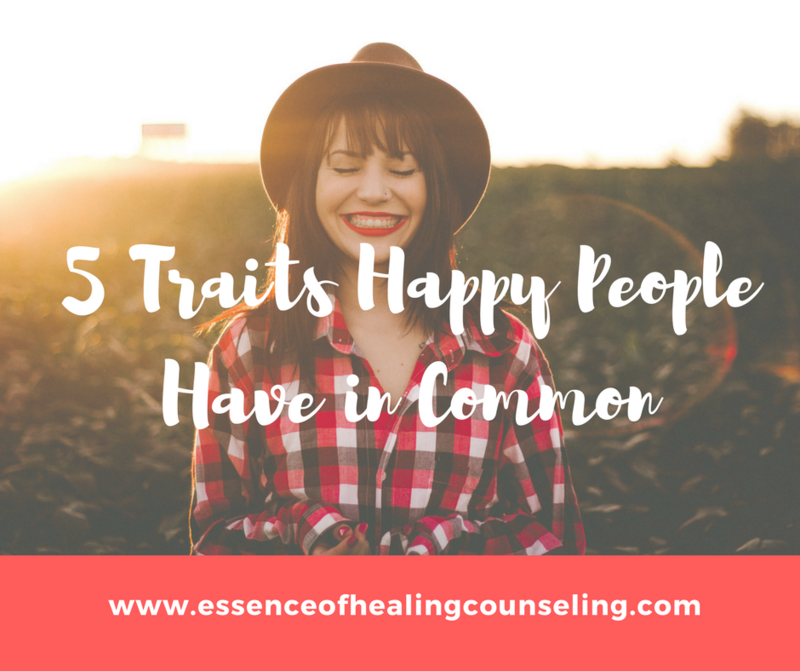 Read below to find common traits that people that are happy share. An easily identifiable trait in people that are happy is their high sense of self worth. People that are happy do not focus on their own flaws and weaknesses but rather focus on their strengths and positive traits. They take the time to recognize and appreciate who they are and what they have accomplished in life. They don’t feel anxiety, discomfort, or awkwardness when others compliment them. They are comfortable when others praise them and are even comfortable praising themselves. People who are happy do not dwell on their own imperfections or any mistakes they make. Instead they see imperfections and mistakes as opportunities for growth and positive change. Happy people are optimistic and positive. They understand that being positive helps them ward off stress and anxiety. They don’t live in a world that is perfect or a fairytale. They also experience trials and tribulations like anyone else. What sets them apart is that when they are faced with adversity they try to see the brighter side of things or look for that light at the end of the tunnel. As a counselor and therapist I use a technique called reframing with my clients in therapy. Reframing entails looking at something through a different lens and giving it new meaning. For example, a person sees their parent as overbearing or over involved in their life. Instead of seeing that parent in that light, they can reframe it by recognizing that they have a parent that really loves and cares about them. Happy people are capable of reframing challenges and negative experiences. People who are happy recognize that life is not perfect and that you cannot have everything you want in life when you want it. They are however extremely grateful for all the blessings and gifts that they have in life. Happy people know the true meaning of gratitude. They verbally express how grateful they are to the people in their lives that give them love and support. They show appreciation when others take the time to help them and be there for them. People that are happy do not take anything for granted but instead truly value everything in their lives whether big or small. Happiness is easily associated with laughter. People that are happy have a great sense of humor. They can find humor anywhere, even when they are faced with adversity. Instead of chastising themselves when they make a little mistake, happy people are capable of stepping back and laughing at themselves. They understand that life shouldn’t always be taken too seriously. Happy people take the time to enjoy life and have fun. They know life can’t always be all work and no play. Happy people are not shielded from hurt and pain. They also experience being disappointed and hurt by those that they love and trust. What happy people know is that they don’t need to let it devastate their lives. Forgiving others that bring harm to us is very difficult, but happy people know that they must work on forgiveness no matter what it takes. Forgiveness doesn’t mean you have to ignore or deny what happened to you. A part of forgiveness is recognizing the pain you experienced and giving yourself the time to heal. Happy people give themselves the time to grieve but then pick themselves up and move forward. When we harbor pain and resentment we only keep ourselves down. When we forgive we let ourselves free. Do you possess all the 5 traits above? If you don’t, take the time to cultivate each trait. Start making positivity, high self-esteem, gratitude, laughter, and forgiveness a part of who you are and start living a happier life. Roberta Alves is a therapist and counselor at the Essence of Healing Counseling with locations in Ft. Lauderdale and Coral Gables. She is a Certified Anxiety Specialist and has a high success rate with eliminating anxiety from her clients’ lives. She uses a scientific and evidence based type of therapy called Cognitive Behavioral Therapy which has been proven to be extremely effective in treating anxiety. Roberta is truly passionate about the work she does and loves serving her clients in the Coral Gables and Ft. Lauderdale areas.